We’re thankful for their snuggles. We’re thankful for their love. 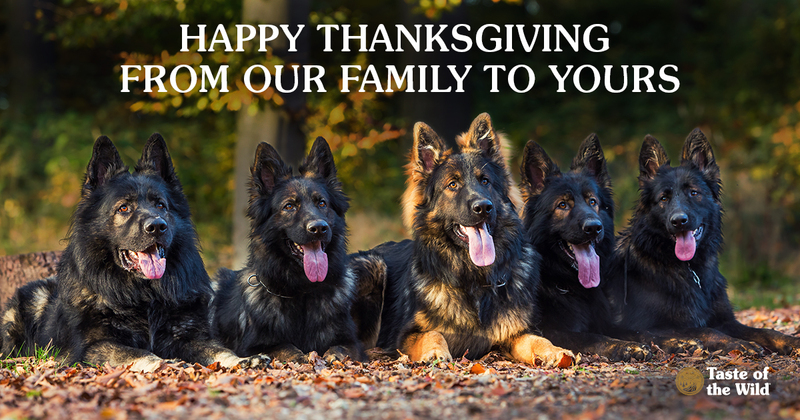 We’re thankful for the simple sound of a tail thumping the floor. As pet lovers and owners, we’re always thankful for our pets and the comfort and joy they bring to our lives, though we sometimes take it for granted. So there’s no better time of year to reflect about all the things the silly dogs and stoic cats bring to our lives. Here are a few reasons we’re thankful for those silly dogs and stoic cats. We hope you agree, and happy Thanksgiving from Taste of the Wild! Dogs and cats don’t care what we look like, how much money we make, where we grew up or who we voted for. They accept us for who we are without any judgments or ultimatums. Our dogs won’t stop hanging out with us because they made a new best friend who’s cooler than we are or gives better treats. Cats certainly don’t turn up their noses if you have a warm lap, even if you were snuggling the dog next door. As long as we give our pets the attention and affection they need and deserve when we’re with them, there will be no limit to the love and affection they’ll return. There’s a reason why so many people spend hours watching silly cat and dog videos on YouTube and Facebook. It’s as if comedy has been encoded into their DNA! We double-dog dare you to spend an hour with your pet and not smile. It’s impossible — we’ve tried it — even when your pet is sleeping through that hour. And if your pet is wide awake, it’s hard not to smile or laugh out loud when your pet chases their tail, has a case of the zoomies or replies with a meow or bark when you talk to them. Dogs and cats live in the here and now. They don’t dwell on what happened yesterday, and they don’t worry about what will happen tomorrow, next month or two years from now. That’s a lesson more of us humans need to learn. Cuddles and snuggles and kisses, oh my! Okay, so you sometimes complain that your Labrador retriever has to sleep in the middle of the bed. Or you awaken to the cat draped across your head. But admit it: cuddling with your furry friend is one of the best perks of pet ownership. Not only does snuggling with our pets chase away the cold as the weather outside gets colder, but it comforts and relaxes us (and them). Come on, admit it. You’ve used your pet as an excuse to leave a party early or to avoid something else you’d rather not do — and for that, we thank them. For what it’s worth? Surveys show choosing to spend time with your pet instead of other people — including your partner — is more common than you think. Many studies have explored the relationship between pet ownership and heart disease. Although the results are mixed, they do suggest that pet owners often have lower blood pressure, experience smaller increases in heart rate and blood pressure under stress, and are more likely to be alive one year after a heart attack than people who don’t have pets. Now that’s something to be thankful for! Additionally, dog owners are more likely to get the recommended amount of physical activity than those people who don’t have dogs — assuming, of course, that they do their own dog walking. Even passive contact with pets can be beneficial. Petting a cat or watching fish in an aquarium can lead to lower blood pressure and slower heart rate. Several studies also suggest pets help reduce depression, stress and loneliness. Pets also can provide a sense of purpose, responsibility and structure that can decrease anxiety for some people. So eating an apple a day isn’t the only way to stay out of the doctor’s office. To learn more about all of the ways pets can benefit human health — the pet effect — and the research being done to document it, visit the Human-Animal Bond Research Institute’s website. When you’ve had a tough day at work and no one wants to hear about it, your pet will listen to every detail. Or at least they’ll look like they’re enthralled. You also never have to say, “Don’t tell anyone!” When you share with your pet, you know that all the mistakes you made and all of your deepest, darkest secrets are safe within those soft, fuzzy ears. Best of all, there’s no judgment or advice on how to fix things. There’s just comfort. Some people might say that pets keep us busy. Like us, pets have basic needs for food, water, shelter and attention. They also need to be cleaned up after. While these tasks may seem to be busy work, in reality, caring for someone other than yourself provides an outlet for the nurturing instinct that we all have. Caring for a pet makes us feel needed, and that feels good.